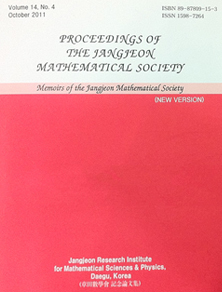 Proceedings of the Jangjeon Mathematical Society is devoted to significant research of broad interests in pure and applied mathematics. This journal will appear four times yearly. The 2011 SJR in SCOPUS for Proceedings of the Jangjeon Mathematical Society is 0.035 with a ranking 553/839(65.9%) in the category of mathematics.